When people go abroad to volunteer it often makes a huge impact on their lives. 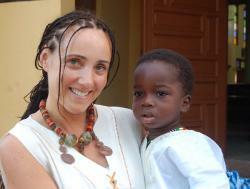 This is certainly the case for Petra Oblak, who volunteered on a Care Project in Ghana in September 2009. Petra worked at an orphanage in Accra, and while she was there she saw how some of the children moved out of the orphanage when they were adopted. Many volunteers comment about how they would have loved to bring a few of the kids home with them, however, for Petra, this became a reality when she returned many times to Ghana to go through the process of formally adopting one of the children she worked with. In her most recent visit, Petra adopted 3 year old Kofi, whom she met during her very first days in Ghana. Petra and Kofi now both live in London but they plan to return to Ghana regularly. We wish Petra and Kofi the very best for the future.